From the director of the 1991 Academy Award winner for Best Foreign Language Film, Mediterraneo, comes this picture, which Italy entered into the Academy Awards competition for 2003. The movie is based on the best-selling Italian novel of the same name by Niccolo Ammaniti, who also helped adapt his book into a screenplay. The plot sounds pretty bizarre, yet interesting, if you ask me. The movie takes place during a record-breaking summer heat wave on the island of Sicily in 1978. 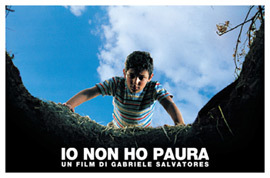 A young boy named Michele (Giuseppe Cristiano) finds another boy named Filippo (Mattia Di Pierro) being held prisoner beneath an abandoned house in his town. Michele decides to snoop around and find out what’s going on. He soon discovers that the adults of the town, including his parents, are all involved in a ransom scheme connected with the Filippo’s kidnapping. I told you it was weird, didn’t I?